Start your space-saving desk at the top. GREENGUARD laminates, 1" thick bamboo, and reclaimed wood are available in compact sizes! Save 6" of depth or width. Standing desks that are 24" deep or 42" wide give you big health benefits even if you don't have a big space. Have your pick from a 1" thick premium Bamboo desktop or upgrade to a wood desktop made from upcycled Douglas Fir. Space Saver desktops are available in 24" and 30" depths and a variety of widths to fit any sized space: 42", 60", and 72". Although we call this desk "shallow depth," its capabilities run deep. We created this desk for areas with limited room or that need to fit as many desks as possible. With only a 30" depth (smallest size is 42" W x 30" D), we've minimized the real estate to help you maximize your floor plan. We didn't forget about looks, either. Your desktop choices include rubberwood solid wood and 1"-thick carbonized bamboo. We also offer both black and white finishes on our eco and GREENGUARD-certified laminate desktops. This desktop rests on our patent-pending UPLIFT V2 Frame, which features improved stability and includes an accessory mounting point system built right into the frame. Wirecutter loved this frame so much (paired with our bamboo desktop) that they named it "Best Standing Desk." That's right, this one is the winner. Maybe your office uses all-in-one computers, and you're going for a minimalist look. Perhaps you just can't squeeze a dozen normal-depth desks into your space. Whether it's about preserving walkways or finding a desktop that perfectly suits your layout, this desk is just for you. These height adjustable desks are available in seven different styles, including natural (solid woods and 1" bamboo), powder-coated MDF, and GREENGUARD-certified laminates. All seven of these styles are Earth-friendly, either because they use recycled wood, are derived from sustainable materials, or don't require more trees to be cut down. And since we don't use any harsh chemicals in our finishes, they're also friendly to your air quality. Not quite sure what size or shape of desk you need? Check our our corner and L-shape desk configurations—and plenty of full-depth desktops. See our Desk Selector Tool. Browse our Desktop Brochure for a comprehensive look at your desktop options. What Makes UPLIFT Desk Unique? We're industry leaders in the standing desk category because we make some of the most reliable, fastest, and safest desks available. Our frames are reinforced for added strength and stability, so you get a desk that not only fits your space well, but also stands up to years of height adjustment—providing you with the platform you need to do your best work. The UPLIFT V2 Frame can adjust from 24.5" - 50.1" high (without a desktop), which covers the ergonomic requirements of most of our customers. It has all the durability, reliability, and speed you'll need for standing-desk success—and it comes with our integrated mounting point system for UPLIFT Desk accessories. The UPLIFT V2 Commercial Frame is designed for people who need a lower minimum height and more adjustability—and it conforms to the ANSI/BIFMA G1-2013 height standard, which many companies are required to meet. This frame raises and lowers between 21.6" and 47.7" (without a desktop). The UPLIFT V2 Commercial Frame is designed to support ergonomic working postures for 5th percentile females through 95th percentile males, in seated and standing positions. That's what the ANSI/BIFMA G1-2013 height standard is all about. Both the UPLIFT V2 Frame and UPLIFT V2 Commercial Frame feature one of our coolest innovations: 48 accessory mounting points, drilled right into the frame body. This patent-pending system gives you four dozen different spots to attach an UPLIFT Desk accessory directly to our sturdy metal desk frame. Coming soon, you'll be able to add desk space while mounting your computer tower beneath, mount a power strip, mount a foot hammock, and more—all using this quick-attach system. To get you started, we created an under-desk hammock, perfect for assuming a different posture in your own space. It's fun and is a great change of pace. Believe it or not, your desk is strong enough to hold an entire 200-lb person; just attach the hammock to the frame and give it a try. Please note: the hammock is only compatible with the UPLIFT V2 Frame. It's not compatible with the UPLIFT V2 Commercial Frame because the stability crossbar interferes with it. You selected a desktop that fits your space needs; here's a keypad that gives you the control you need. Why waste time holding the up or down button until you get the desk where you want it? With the Advanced Keypad, you have four memory presets that you can program for your preferred heights. Just tap a button and watch as your desk raises or lowers to the right level in seconds. This keypad also manages the sensitivity of the anti-collision safety function, which is what tells your desk to stop when it bumps into objects. And it comes with a child lock, to keep curious hands from playing with the desk while you're not watching. If you know that you won't want the desk to raise or lower beyond certain heights, because of items that sit above or below the desktop, the keypad includes a max/min height setting. And our designers even thought about the LED. 10 seconds after you press a button, its display darkens, to reduce distracting light at night. It's a huge honor to have our desk named as the "Best Standing Desk" by both Wirecutter and Forbes—and we're grateful that Wired, Lifehacker, and many others have rated us #1. Are you ready to join the hundreds of thousands of happy UPLIFT Desk customers, including hundreds of Fortune 500 companies? From the bottom of our hearts, we'd like to say thanks for all of your support. We built UPLIFT Desk based on your input; and our goal still remains the same. We're on a mission to help every person and every office create the workspaces they need to accomplish their most important goals. We're committed to delivering desks that meet the highest standards of quality, while keeping our prices low. Because of your continued support, more and more people are working better and living healthier each year. Thank you so much—we couldn't have done it without you. When working at a height adjustable desk, which moves up and down at your command, you'll want to have power solutions that move with it to prevent cord pulling. Our in-desk grommets, clamp-on power modules, and surge protectors are all tailored for the dynamic desktop, providing you with the cord slack your devices need to keep them from coming unplugged as the desk moves. Especially on a smaller desktop, you'll want to choose a cable management solution that helps you stay organized—and safe. Yes, cables that are routed and bundled look nice, which can help set the tone for your work experience. But properly managing your computer cables also helps prevent snagging. As you move your desk into standing or sitting positions, a snag could pull something out of the wall, or off of the desktop. To help you get started, we include a wire management tray with your UPLIFT V2 Shallow Depth Standing Desk. Building a new office—or adding a new bank of desks? We're here to help. If you're thinking about purchasing four or more UPLIFT Desks, we'll put together a desk layout for your floor plan, absolutely free. Let one of our expert consultants help you find the best options for your workspace. Just complete four simple steps, and we'll develop a desktop layout designed specifically for your office. To top it all off, we'll give you a discounted quote for your desk order. I plan on upgrading to a larger desktop later—can I still use this same frame when I do? Yes, definitely! The UPLIFT V2 Frames are interchangeable, so most parts are the same on all of our desk bases. When you're ready to move to a larger top, you will just need the full size crossbars and crossbar ends to make your transition. If you need help, please contact one of our friendly Sales Pros at 800-349-3839. Do you have any desktops that are 24" in depth? Yes, our eco, bamboo, laminate, and rubberwood desktops are offered in 24" depths. Can I get a desk that is narrower than 24"? Our 24" tops are the narrowest desktops we keep in stock; they're ideal for most compact spaces. If you need something custom made to your measurements, we can cut our laminate and solid wood desktops to meet your exact specifications—but, the side brackets on each side of the UPLIFT V2 Frame are just under 22". That means that you cannot use this frame on a desktop that's less than 22" deep. We wanted to shine a light on our most compact desktops, while also simplifying the desk buying process. That way, your choices aren't overwhelming as you build out the standing desk of your dreams. Why should I use the shallow depth desk over a smaller version of a traditional desk? Most of the UPLIFT V2 Shallow Depth Standing Desks are 24" deep, versus the standard 30"-deep tops available on other UPLIFT Desks. This makes them the perfect solution when you're working with limited office space. If you require a shallow desktop in a size you don't see here, we can make you a custom laminate or solid wood desktop for you. For a quote, call, chat, or email our sales team, and we'll be happy to help! Do the feet of the desk protrude past the desktop? No, our shallow depth desks come with a set of narrow feet, so that they won't stick out past the edge of the desktop. 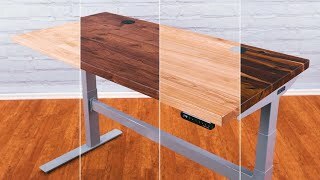 What accessories can I install on the UPLIFT V2 Shallow Depth Standing Desk? Due to the small amount of space under the desktop, some accessories are unavailable. Check with our builder for compatible accessories, or contact our sales team for more info! Can I buy a desk smaller than 42" wide by 30" deep? At this time, the smallest top we offer in stock is the UPLIFT V2 Shallow Depth Standing Desk. Are there any differences between the shallow depth desk and the regular UPLIFT Desk (besides the depth)? The bracket that attaches to the desktop is the same size, but the feet on the shallow depth desk are shorter, since it does not need as large of a base to stabilize it. In other words, you'll get the same great 3-stage frame as offered with the other UPLIFT Desks. Can I use a treadmill with this size desk? We strongly recommend a desk that is 72" wide for use with a treadmill. At that size, you can keep your treadmill handy while still being able to stand or sit. Which control box is on my desk? Just take a peek at the silver label on your control box (under your desktop). If that label indicates v4.1, v4.2, or v4.3, you have the newest version of UPLIFT Desk's control box, complete with new features! When adjusting the height of your desk, it stops when if it comes in contact with an object (to help avoid damage and injury). Our updated version 4 control box comes with a handy new safety feature called collision sensitivity. This allows you to set three different levels of sensitivity for this anti-collision function. There's also a keypad lock, which enables you to keep other people (children included) from adjusting the desk height (when it's locked). You can now toggle quickly between one-touch and constant-touch height adjustment modes. Whether you're metric or standard, you can now switch between inches and centimeters on your keypad. Why does UPLIFT Desk use 3-stage frames? 3-stage frames use three spindles and can change heights 33% faster than 2-stage legs, which many of our competitors use (to cut costs). A 3-stage frame also means you get a larger height adjustability range, so our desks fit both shorter and taller users (and even kids)! Why are dual motors important? All of our frames come with a dual-motor design, so each leg gets its own motor. This makes our desks much quieter when raising and lowering—as well as stronger, more reliable, and safer than desks with just a single motor. We think you'll agree: it's the little details that add up to make an outstanding desk.